It’s not strictly true that I know nothing about sports. Add “entertainment” to it, and I know plenty. So, today was the Australia Day holiday (I’m in the #changethedate group, if you cared, but a day off, etc…), and also the WWE Royal Rumble. Now, regular listeners to Vertical Hold (you have subscribed and left a review, right?) will know that there’s a running gag that I know nothing about sports. It’s not entirely true — I just don’t care as much about sports as the average Australian, and often think we put too much focus on sports as a nation. But I digress. Thanks to the efforts of a man who I shall simply call “Big Al” — because that’s basically his name — when I was at University I did rather get hooked on a sport that… isn’t. Quite a sport, that is, by way of professional wrestling. My interest ebbs and flows from time to time, and while I don’t think the WWE is in a particularly strong period right now narratively, despite the insane level of talent on offer, it’s also not often I’m able to watch an event live. On the network, free 30 day trial, etc, etc. If you watch any WWE programming, you know the drill. Anyway, my thoughts, in usual scattered fashion, are below. This is, clearly, the worst thing ever. I’m sorry if you accidentally hit play. The opening women’s match was very, very good. 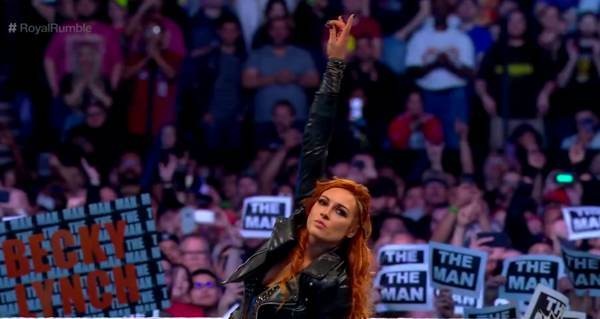 Smart move to make Becky Lynch, the most over act in the company by a wide margin go on first, even though it did rather signal the fact that she might make a *cough* reappearance later. Oh, god, the tag team match was… actually worse than I thought it was going to be. I mean, fair play to The Miz and The Club, but Shane McMahon is just the worst. Great Khali bad, and I have zero desire to see him on my TV in any capacity. Ronda Rousey’s match with Sasha Banks was never really in doubt in terms of the outcome, and it’s incredible to think how far Rousey’s come in the art of staged fighting in a year. Still, I struggled to get into it. I think it’s Rousey’s constipated-pain-face when she gets hit. Although obviously, don’t tell her I said that. She scares me. And then onto the women’s rumble. I loved that there was a women’s rumble last year, but didn’t love the actual match, which felt sloppy, no doubt hampered by the immense number of callbacks they did to older women who had wrestled for WWE in the past. This year’s affair was a lot tighter — I can’t recall any “legends”, unless one counts Mickie James, and she’s on the regular roster, so no. I have a running gag about Hornswoggle living under the Royal Rumble ring, and made that exact joke when Selina Vega went under there. To say my house EXPLODED in laughter when Hornswoggle actually appeared would be an understatement. Possibly the biggest at-home pop of the night, and for a comedy spot at that! A great, great tease for Becky coming out, with the crowd chanting way before it became obvious that Lana wasn’t going to compete. WWE hasn’t always listened to the fans when it’s come to Rumble participants, but this time they did. That being said, that end sequence ran a little long and drawn out for my tastes. On a show that clocked in at around 5 hours, that’s a big problem. On any other show, I would have adored watching Daniel Bryan (who I interviewed here) versus AJ Styles. But combining Styles’ personal politics (which don’t accord with mine), the rather stale nature of the feud and the amount of time already taken up by the show, and I was plain burnt out. Coffee break time, but thankfully they kept the belt on the hotter Bryan this time. I’d like to take back my comment about Shane O’Mac. If only because there’s someone I want to see even less, and that’s Brock Lesnar. He looks bored, he does about four moves, like Ronda he does the “about to crap himself” pain look (maybe it’s a UFC training thing?) and I’m totally over WWE feeding him the entire roster. Just feed him to Braun Strowman and let him go back to his farm and shoot things. Again, obviously, don’t tell Brock I said that. He also scares me, and with good reason. Yeah, I know, he doesn’t care, sleeps at night on a big pile of money with Sable, and all that. There’s one simple thing I want from a Rumble, and it’s a good storyline. It’s a concept I love because you get a lot of change, and can use it to tell interesting stories, as long as you clear out the dead wood from time to time… and don’t rely on that stupid “over the top rope, so you can rest outside if you slide out the bottom” thing they loved last year. So of course, there’s a whole lot of that this year too. Elias did a good, but long promo job to start the men’s Rumble. I won’t blame him for the fact that four hours in, my endurance was starting to seriously flag. Jarrett was a nice legend appearance, and did the job nice and fast. The biggest problem this year was the classic Rumble problem — unless you’re going to mega-elevate someone quickly, there’s usually only one or two actual candidates to win the whole thing. I figured they’d keep Braun going for it, but Rollins was the other obvious pick. Other things I’m over are Kofi Kingston’s survival spots — because they’re a clear sign he’s never winning, just in case something goes wrong — and the really weird way they shot most of both rumbles. Unless you know all the theme music very well, it’s tough to keep track of new entrants. I’m still mulling over Nia Jax’s appearance. I called that Truth would get walloped by someone and replaced, but I don’t think anyone would have picked Nia to be that someone. It’s cute, but what does it lead to, again in that storyline sense? Best bit of the night: Becky Lynch, obviously, although hidden Hornswoggle was pretty good. Worst bit of the night: Brock Lesnar on my TV screen. Just go away! Would I rewatch it? Probably not in detail. Rumbles are good background TV, but 5 hours is just too long. Of course, they’ll do even more when Wrestlemania rolls around. Also, I’m still really, really sorry about embedding “Be a Man” above. Hmm… how to make it up? Oh… yeah!